Making your own compost starts in the kitchen by collecting all your organic waste and adding it to your outdoor composter. As much as 30% of household waste can be composted and should not be sent to a landfill. 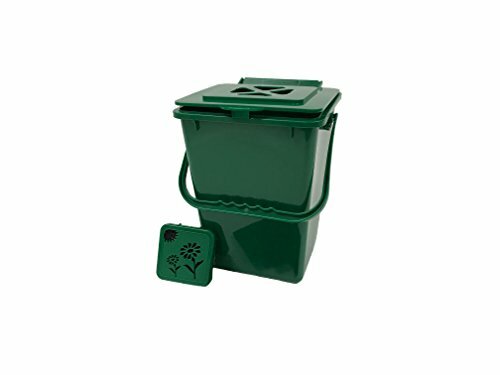 Composting is the answer and using the Kitchen Compost Collector is a most practical way to collect all of your organic waste. This kitchen waste collector is made from high density polyethylene and includes a carbon filter that significantly reduces any organic smells. Convenient handle lets you carry waste directly to outside composter and is dishwasher safe. For best results use only ECO 2500 replacement filters (3.5" x 3.5") only shipped and sold by Amazon. Please note: Packaging may contain special spacers (in the shape of a "house") used to separate multiple units, these should be recycled as it holds no further use to the ECO 2000 Composter Bin.